Bay Brewing Iwasaki IPA is a 6.8% American India pale ale from Bay Brewing Yokohama. It is brewed using Yokohama-grown barley from Iwasaki-san, hence the name, who lives in Yokohama. It is triple-hopped with Falconer’s Flight, Motueka, and Chinook hops in the boil and then dry-hopped with Amarillo hops. At the time of writing, Bay Brewing Iwasaki IPA is only available on draft only. Skimming over the beer menu at Bay Brewing Yokohama is always an interesting time. Shinya Suzuki, owner and head brewer, puts a lot of effort into ensuring the menu is as informative as it can be without overdoing it. Moreover, you often wonder how much of the beer is brewed onsite or at Gotemba Kogen, who seem to be making beer for everyone and anyone it seems. Bay Brewing Iwasaki IPA is an original beer from Suzuki-san though it was unclear whether it’s brewed onsite or not. It poured out a cloudy golden colour with a lot of particulates floating around the glass. The aroma coming off of it was bursting with citrus aromas of grapefruit and lemons along with a subtle flowery aroma too. I guess with so many different varieties of hops, it was always going to be tough to nail down the aromas. Bay Brewing Iwasaki IPA is a big, bold beer that came as a big surprise for me. Every time I’ve been to Bay Brewing Yokohama, I’ve had beers that were more subtle with their flavour profile but with this one, Suzuki-san has tried to go big but at times, it felt like too much. I like my American IPAs but the citrus flavours were too often dominated by the bitterness from the hops. The aftertaste felt a bit syrupy for my liking too. 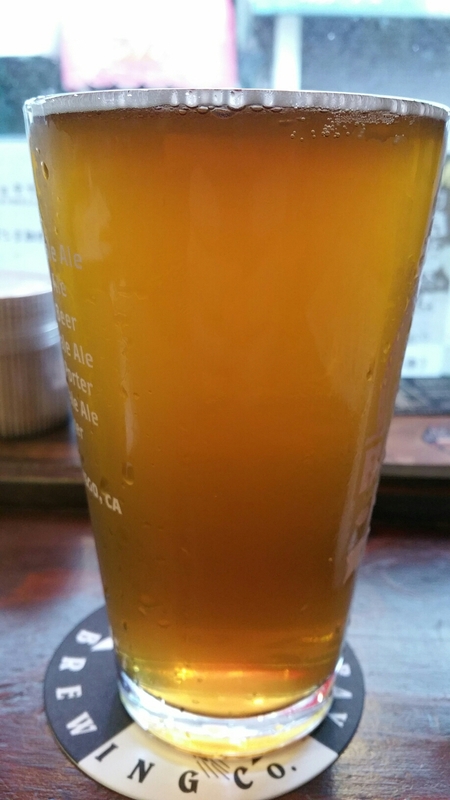 With a bit of tweaking, Bay Brewing Iwasaki IPA could be a nice, thirst-quenching beer. At the moment, it’s an ok imitation of an American IPA.